September 11, 2001 was my friend Diana’s 30th birthday. I planned on meeting her at the Oyster Bar in Grand Central Station after work. Instead I walked across the Manhattan Bridge in a cloud of ash and crumbled concrete, looking back at the hole in the skyline. We all walked across the bridge. It was packed with people wearing business suits and sweatpants. I remember seeing a man on a bicycle riding towards Manhattan with a camera slung over his neck. “You’re going the wrong way,” I wanted to shout. Who takes pictures at a time like this? I remember there was a man in a yarmulke handing out bottles of cold water as we left the bridge on the Brooklyn side. I was so grateful. I was uninjured. I had an apartment in Windsor Terrace that I was walking towards, but that sense of uncertainty—what will the future hold? What will change? When will I go back to work?—loomed large. In the days that followed, I saw the best of America in New York City—my home. Real mourning, deep soul-searching, amazing altruism and self-sacrifice, and vigorous but respectful debate about why this tragedy happened. “Our grief is not a cry for war.” That was the slogan that emerged in those days and it reverberated through my city—a truly international metropolis. The citizens of more than 80 nations were killed when the towers fell. Undocumented immigrants, homeless people, white shoe lawyers, seven figure corporate executives, emergency responders all died. And there has been little hope of a peaceful tomorrow in the ten years that followed George W. Bush’s declaration of war and the bombardment that began on October 7, 2001. After 9/11, I threw myself into the peace movement with new vigor. If Rita Lasar and David Potorti and Colleen Kelly and Amber Amundson—members of Peaceful Tomorrows who lost close members of their families on 9/11—could turn their grief into peace-making and reconciliation, then I—who lost no one—could too. Each anniversary that has followed, I have made a point of walking home from work, walking across the Manhattan Bridge and recalling the fear and anxiety and uncertainty that I felt that day. Reminding myself of the nearly 3,000 people who died—most of whom died in my city, recalling as many of their names as I could… Bill Kelly, Jim Potorti, Abe Zelmanowitz, Craig Amundson; reminding myself too of all those who have died (and continue to die) in Afghanistan and then in Iraq, Pakistan, Yemen, Guantanamo and elsewhere as the war on terror metastasized into a global war. Each anniversary I have been part of peace vigils, civil disobedience actions, candlelight vigils. One year we did a 24 hour vigil in Washington Square Park and the next morning did a die-in in Union Square. Another year we held a reading of the names of 9/11 victims and Afghan war victims in front of the military recruiters office in Times Square. I wrote essays and analysis and reflections about 9/11 and beyond. This year is different. This will be the first year I will not walk across the Manhattan Bridge, the first year I will not work in Manhattan and live in Brooklyn. I moved to New London, Connecticut last November and I will not rally or demonstrate or vigil this year. I will not attend any of the countless 9/11 Tributes and Memorials and Conferences and Art Shows and Demonstrations planned for this weekend. Instead, I will make a pie. It sounds funny, I know. After almost a decade of activism on this specific date, I will mix flour and butter and salt and roll out dough. I will pick pears from my community garden plot a few blocks away. I’ll peel and core them. After I cut them up and mix them with cinnamon, nutmeg (we are the nutmeg state), brown sugar, lemon juice and black pepper (my own secret—oops—ingredient), I’ll assemble fruit and dough into a pie and let it bake. 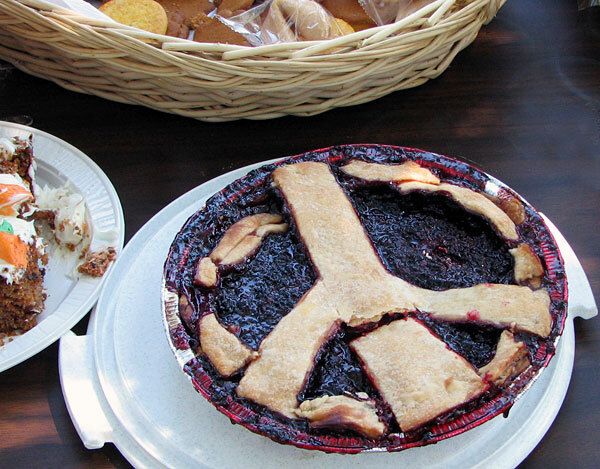 As I do all of this, I’ll consider the “Pies for Peace” meditation written by Reverend Carolyn Patierno of All Souls Unitarian Universalist Congregation, where my husband and I go for services (not as often as we’d like). May we hold close the ways that we are connected to the land and to all sentient beings. May they nourish what is bitter with what is sweet. Let there be love. Let there be plenty. Let there be peace. And let it begin with us. Reverend Carolyn came up with Pies for Peace, to “remind us that however humble our effort we are all responsible for building a new world,” and asks “What better day to recommit ourselves than September 11, 2011?” I will also think of my friend Diana, now living in Los Angeles and celebrating her 40th birthday this weekend. I hope she eats oysters. This is all so much more modest than lying down in the street or vigiling while standing upright. But, it feels right for me as I mark my first September 11 as a non-New Yorker. “Let there be love. Let there be plenty. Let there be peace” and let it begin with me.